It’s a common middle school occurrence. Everyone gathers in the gym for their annual eye exam, and perhaps a hearing test. This year, a new type of test was introduced to me; the Scoliosis screening. Many of you have probably forgotten this aspect of pre-pubescent health maintenance, but since it changed my life, I will always remember it vividly. Scoliosis is a condition that causes a curvature of the spine. It is genetic, and is seen more predominantly in girls than boys (girls are six times more likely to develop the condition). Only a small percentage of people with Scoliosis require treatment, with only about 30% requiring a brace, and 10% requiring surgery. Many people have a slight form of Scoliosis, but it often goes undiagnosed. Uneven hips and shoulders can be an early sign of developing Scoliosis. The most common method of Scoliosis screening is to have the patient bend over to touch their toes, which causes the spine to become more prominent and allows the doctor or nurse to check for any curves. If you’ve seen the movie or read Molly’s Game, you may remember that Molly Bloom also has Scoliosis. Shout out to some other badass well known people with Scoliosis…Usain Bolt (there goes my excuse that I can’t run due to my condition), Elizabeth Taylor, Shailene Woodley, Liza Minnelli, and Vanessa Williams. Early diagnosis is key, as treatment can greatly affect a patient’s overall health and even save their lives. When I was diagnosed with Scoliosis in 7th grade at the tender, and often melodramatic, age of twelve, I thought it was literally the end of the world. After the screening, I was informed that I was an “at risk case” and that I needed to see a specialist. I was incredibly scared and didn’t know what to expect. My mom and I read up on the condition, treatment options, anything we could get our hands on. I was referred to Shriners Hospital for Children, where I met with a bone condition specialist. He confirmed that I had moderate to severe Scoliosis, and would require treatment. This treatment? A back brace. As I’m sure you did just now, I also flashed back to every teen movie I had seen about the class loser, with headgear, a back brace, glasses…you know the stereotype. I was horrified. I was pissed off. After the doctor left the room, I cried, stamped my feet and firmly told my mom I would never wear the brace. I was still distraught and acting out as we walked towards the exit of the hospital, when something stopped me in my tracks. In the waiting room, I saw several other children. One of them was laughing and sitting in a wheelchair, his legs ending at his knees. The other, was twirling around dancing, raising her prosthetic arms in the air. They were happy; they were playing; they were completely normal. They didn’t let their condition affect them at all. From that moment on, I promised myself that I would not define myself by my disability, that instead I would embrace it (see what I did there?). I would become a stronger person not in spite of it, but because of it. Most of my teachers and classmates were not familiar with Scoliosis. The other kids at school asked me, “Does it hurt? Is it contagious? Are you going to die?” I was the resident Scoliosis expert, educating my peers on the condition, and reassuring their uncertainties and fears. I chose to wear the brace under my clothes, but it was still very obvious by my posture and limited movements. There were a few awkward moments. One time during the early days of my treatment when I was still getting used to my brace, I was sitting in math class (already my least favorite part of the day), when I dropped my pencil on the floor. Under normal circumstances, I would be able to just reach over and pick it up. However, due to the structure of the brace, I was unable to bend my back or move my hips. This caused me stretch too far, which made me lose my balance and fall off of my chair onto the floor. To make matters worse, when I landed on my back, I could not get up. Picture a turtle stuck on its back, and then imagine a much more awkward flailing 12 year old. That was me. I wanted to cry on the spot and disappear into the floor, but in situations like that all you can do is laugh it off. Another defining moment was changing for P.E. class in the locker rooms for the first time after getting my brace. As if I wasn’t uncomfortable already with my changing body during those awkward years…adding a back brace did not help. On the first day I wore my brace to gym class, I was the recipient of some stares when changing in the locker room. My brace was worn 24/7, except when exercising or showering. As I took off my shirt to reveal my brace, I felt the gaze of my peers. For many, it was the first time they had seen a treatment brace like mine. Over time, they got used to it and the stares didn’t last for very long. I quickly realized that my gym locker wasn’t big enough to hold my brace, so I had to get a special spot in the gym teacher’s closet to hold it during my exercise time. Perhaps my crowning moment of glory was when I was walking up the stairs at school, and the waist of my pants began to slip and actually dropped down around my knees, causing me to fall up the stairs. How did this even happen?! Since the brace protruded several inches from the waist and hips, I had to purchase bigger clothes to fit over it. Shout out to my mom for having the brilliant idea of sourcing clothes from maternity stores (even if I was slightly traumatized by the fact that I could fit into these clothes!) My pants were made out of a stretchy material (think jeggings before they were even a thing), and a bit too big. The smooth plastic of the brace provided no grip for them and they simply fell down. The only way to remedy this issue was to Macgyver a solution with a piece of ribbon that looped from the brace’s ventilation holes through my belt loops on my pants. They were essentially some crazy suspenders! Over time, I learned that the brace could be an asset. It came in handy during chorus when we needed a woodblock percussion substitute. I could simply knock on my plastic brace and drop some beats. It also acted as a really clunky, uncomfortable plastic version of Spanx…I always had the flattest tummy! Additionally, I was able to use it as a creative outlet and doodle on the brace with dry erase markers, providing a portable whiteboard for me and my friends. Kids can be cruel, especially during middle school. I’m sure that I was the brunt of many jokes, and did get plenty of side eye. However, I was so fortunate to have the best friends, family, and teachers in the world. They were my cheerleaders, my therapists, and my shoulders to cry on when things got tough. I can’t even begin to express my gratitude for Shriners Hospital. The Shriners are members of a society based on fun, fellowship, and the Masonic principles of brotherly love, relief, and truth. My grandfather is a Mason, and my boyfriend is a Shriner, and the Shrine’s charitable arm is Shriners Hospital for Children. This hospital network treats children with with neuromusculoskeletal conditions, burn injuries and other special healthcare needs within a compassionate, family-centered care environment. They provide free healthcare to all children in need, and I was fortunate enough to be under their care from the time I was 12 until I was 18 years old. As part of this treatment, I was assigned a caseworker who was always there for my emotional and medical needs. I wore my brace full-time until I was 14, wore it every evening while I slept until I was 16, and then I had physical therapy provided by the hospital until I was 18 years old. I will forever be grateful to the staff at Shriners Hospital, who became my family. I am also so thankful for my mom, who came with me to every single appointment, amassing hundreds of hours in doctor’s offices with me. Not to mention the hours she put in on crazy shopping trips that often ended with tears in the dressing rooms. 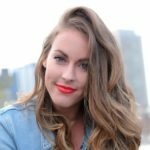 Fast forwarding to the present….I recently met Sarah Herron, who many of you may have first encountered in Season 17 of the Bachelor, and later in Bachelor in Paradise. I learned that Sarah is so much more than a reality TV star, but is a boss babe and a force to be reckoned with. She is the founder of an amazing organization called SheLift, which empowers girls with physical differences to improve self-acceptance and confidence through outdoor adventures and body-positive mentorship. SheLift provides experiences to young women with disabilities to help them live authentic lives and connect with others. SheLift aims to normalize differences while developing, challenging, and nurturing girls’ physical and emotional abilities. I’m thrilled to know that there are people out there like Sarah who are making such a positive impact on young girls, and I SO wish this was around when I was younger! The main thing I have learned from my experience living with Scoliosis is that everyone has something. There will always be people who are more fortunate than you are, as will there always be people less fortunate than you. The only thing that we can control about life is how we live it. As an illustrator, it is my job to bring fun, color, and whimsy to every surface on the earth, including treatment gear. I am currently working on a line of “brace-friendly” stickers to be placed onto casts and braces to help brighten up the treatment process for the kids who need it the most. Stay tuned for updates! What it means: Not everything needs to be your problem, you can’t take on the weight of the world, and sometimes it’s best to focus on yourself. What it means: We don’t always get to choose where we are placed in life. But wherever you end up, make the most out of it. What it means: The best results and largest growth opportunities often come from situations of adversity. So, friends, what does this all mean in a nutshell? No matter what life throws your way, keep your chin up, shoulders back, and brace yourselves for your next adventure.